It’s 1:00 a.m. and the phone rings. The hospital is calling to tell you that your father has suffered a stroke. A neighbor found him and called 911. Come quickly, they say. You rush to your father’s side, but the stroke has left him partially paralyzed and unable to speak. The doctor says a full recovery is unlikely; he begins telling you a whole list of things you need to do and arrangements you need to make. Looking back, it’s all a blur. What happened? Life has called YOU to become a caregiver! Most of us never think about who will care for our parents when they get older. Many times, middle-aged children don’t even recognize their parents’ aging. They may see them infrequently or may simply not recognize small changes that indicate a problem could be developing. What’s more, many older adults cover up problems. In any case, few of us plan ahead for these changes; usually they take us by surprise—financially and emotionally. Who is a caregiver? A caregiver is anyone who takes care of or provides assistance to an older or disabled person. Interestingly, few adults identify themselves as elder caregivers, but at least one in four American families are doing so. The National Alliance for Caregiving and AARP teamed up to produce a scale that measures the level of intensity for caregiving. “Intense” caregivers are those who perform personal care tasks (bathing, dressing, etc.) for an average of 12-87 hours per week. “Informal” caregivers provide, on average, fewer than 10 hours of care per week. This may include transportation, help with homemaking or yard maintenance, meals, and financial and emotional support. http://www.nfcacares.org/ – This is the website of the National Family Caregivers Association. It can link you to a wide variety of training resources and service information. There are also ways to connect with other family caregivers for peer learning and support. http://www.caregiving.org/ – This is the website of the National Alliance for Caregiving, and it is full of great information for family caregivers, including helpful explanations about the hospital discharge process. http://www.redcross.org/ – The American Red Cross offers caregiving classes at some of its local chapters, including the Central Florida Chapter on Bumby Ave. in Orlando. Contact them by calling (407) 894-4141 or see a complete list of courses on their website: http://www.redcross.org/take-a-class . The Space Coast Chapter in Rockledge does not currently offer the caregiver training, but does offer CPR and Nurse Assistant training. Contact them at 321-890-1002. An approach to dividing caregiving tasks, according to the skills and abilities of each family member or friend, is called Cooperative Caregiving. This approach recognizes that no one person can or must do it all. Rather, caregiving is a team effort with the elder at the center of the action, calling the plays, whenever possible. Whether you are the family elder, a family member or other caregiver, the following list of “job titles” might help you identify the specific type of assistance that you need or can provide. Each family member or helper can commit to fill a specific role or roles, knowing that other roles can be filled by others. If no one in the family’s network is willing or able to perform a specific role that must be filled, then outside resources can be explored, only to fill this specific need. Another key role is that of Care Manager. As the assembler of caregiving resources, the Care Manager’s job may be compared to that of a general contractor in charge of building a house. It is the contractor’s role to identify and secure willing and qualified resources to perform the many different types of construction tasks. Whether a family member fulfills this function or you contract with a professional depends on several factors. Being the “general contractor” for your own or your elder’s care is a big job in itself and may be more than you can handle alone. If the role seems too much for you, consider hiring a professional Geriatric Care Manager, a social worker or elder care professional who performs these general contracting tasks for a fee. To learn more about what geriatric care managers do and what they charge or to find one in your area, go to: www.caremanager.org. If your case is complicated, you live a considerable distance from your loved one, or if you lack family members to assist you, contracting with a Geriatric Care Manager may be well worth the cost. Keep in mind that Cooperative Caregiving is not a copout. You are not shirking your responsibility by asking for others’ help. Remember: Heroes die young; team players live to fight another day! Keep the following tips in mind when caring for an older loved one. Examine your motivation. Think about the reasons why you are taking care of your elder, take ownership for your decision to help, and accept the choices you make. Accept and enlist help. 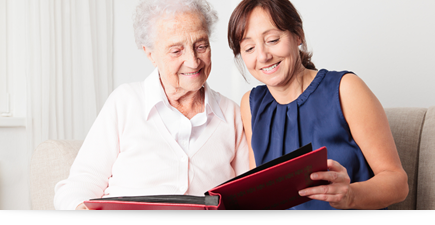 Actively solicit help from family, friends and other sources in caring for your elder. Accept kindnesses that others offer you. Let go of futile efforts. Don’t waste energy trying to convince your elder to do something he or she doesn’t want to do. Be hones about and accept the current situation. Reign yourself in. Be realistic about how much you can actually do. Don’t over commit and don’t sacrifice everything else for your elder’s care. Learn to say “no.” Realize that saying “no” does not make you a bad person. Stick to your guns. Know your personal boundaries and stick to them. Maintain the balance you need to function effectively. Caregiving Resources – A list of websites containing caregiving information and support resources. Caregiving and Decision Making for Seniors – some of the key resources and suggestions for effective care and decision-making for seniors. Caregiver Support Forum – The AgingCare.com online caregiver support group is a place where you can ask questions, give answers, exchange messages, and get support from other family caregivers who understand exactly what you’re going through.